My Own Private River Phoenix. After the tragic death of her childhood crush and actor River Phoenix, Ai Yoshihara came to America in search of her own Phoenix. Before leaving Japan, Yoshihara promised her strict father only three things: “No God, no drugs, and no religion.” But with hardly a plan to find her true love, she stumbles down a messy road of heartbreak, miscommunication, and ultimately, self-acceptance. At the end of her journey, the promises she once made to her father become harder to keep…but she might just rise from the ashes anew. My Own Private River Phoenix is painfully poignant at times and yet it’s an altogether charming and irresistible portrait of a young immigrant looking to find her place in a foreign land. Yoshihara shines brightest at her most tender and vulnerable moments, but don’t let that fool you into thinking this show is a drama. Yoshihara cuts tension in the play with relatable quips about growing up and loving your own damn self. My Own Private River Phoenix is written and performed by Ai Yoshihara and directed by Jessica Lynn Johnson. See the show at Studio C on June 18th at 7:30 p.m. and June 24th at 4:30 p.m. Tickets are $10 and can be purchased here. I Came to Make Noise. Part hip hop. Part interpretive movement. Part spoken word. I Came to Make Noise is about the experience of a woman’s body—how it can be subjected, used, abused, and abandoned for someone else’s pleasure, as well as how technology (think: selfies) have distanced us from our own bodies. Yet creator and choreographer Carrie Mikuls also showcases ways the body and soul can start to heal from trauma—how one unlearns societal expectations by upholding the self: “I am enough. I am brave. I am an American.” Through powerful, visceral body movements and dialogue (performed mesmerizingly by Brooke Ivory, Mariya Gordon, and Mary Polhemus) accompanied by a live soundtrack (NAACP Award-winning actor John “Faahz” Merchant impressively beatboxes throughout the show’s duration and Delante McCreary draws us in with his silky voice), I Came to Make Noise demands you to listen and encourages you to speak up with your story. I Came to Make Noise is written, choreographed, and directed by Carrie Mikuls, and features Brooke Ivory, Mariya Gordon, Mary Polhemus, John “Faahz” Merchant, and Delante McCreary. See the show at the Lounge Theatre (Lounge 1) on June 15th and 23rd at 6 p.m. Tickets are $15 and can be purchased here. Crunch. Female friendships in your early twenties can get complicated, but when one of your high school friends suddenly becomes “a powerful, ravenous, cave-dwelling entity,” it’s downright impossible to make sense of it all. The only thing you can do is skirt around the issue by hanging out at the local gay bar and occasionally visiting your friend’s cave to feed her—er, it—crickets. The storyline of Crunch feels derivative of pop culture stories about buddies who care for a monster-like thing, but it’s nevertheless original with its cast of all women characters who are figuring out their sexualities in the process. The spunky Evie (played by Jax Ball), frantic Justine (Jessie Bias), and level-headed Wendy (Mona Lufti) are the perfect trio to calm the unstable and unpredictable being that is now their friend Beth (made frighteningly real by Danielle Power). Marian Gonzalez plays a series of supporting roles that help catalyze the story’s plot points until the climactic final scenes. 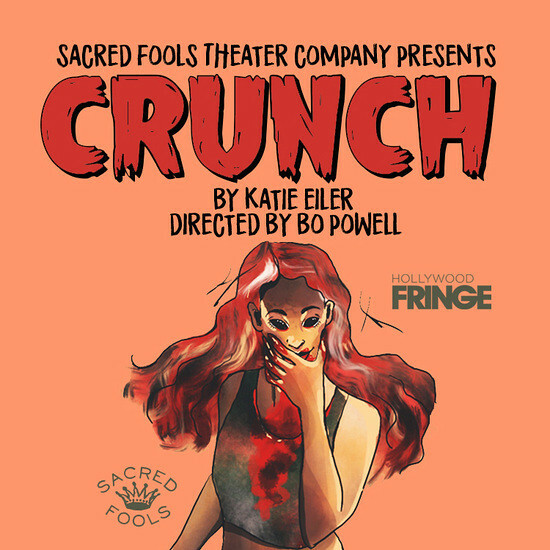 A Sacred Fools Theater Company production, Crunch is written by Katie Eiler and directed by Bo Powell. The show features Jax Ball, Jessie Bias, Marian Gonzalez, Danielle Power, and Mona Lufti and runs at The Broadwater (Black Box) on June 13th and 23rd at 4:30 p.m. Tickets are $15 and can be purchased here. #Metoo. In many ways, Star Stone is just like all of us. She deals with body issues. She makes mistakes. And she yearns deeply for meaningful human connections. But where Stone’s story becomes distinctly her own lies in her relentlessness when faced with adversity—much of which involve sexual assault. As topical as it is personal, Stone’s #Metoo is more than just a hashtag and a movement. It’s also a journey. Stone embodies over 30 different characters—both imagined and real—that push and pull her into darkness and light. Sometimes you’ll laugh out loud at those all-too-familiar points in budding relationships. Other times your stomach will drop as she bravely shares her past unwanted encounters. As the production page notes, “#Metoo is a survivor’s tale,” but it also feels like the first few chapters in Stone’s book on life, and the next chapter is just beginning. #Metoo is written and performed by Star Stone, and directed by Jessica Lynn Johnson. See the show at Studio C on June 16th at 3:00 p.m. and June 22nd at 8:30 p.m. Tickets are $12 and can be purchased here.